This issue has been one of the most widely commented posts. Possibly because it has raised a number of new and old issues — all of which have different levels of importance by different people within the community. In spite of the letters in the local papers from Council, there are many questions still to be asked and answered. There will be more, but these are the ones that immediately come to mind. What is the role of Staff vs Council. Are Council too involved in day-to-day management of the Town affairs versus setting policy? Did staff follow procedures or did they blatantly disregard established procedures? Impact of Council actions on staff morale. Are we getting the best performance from staff or are they hunkering down until the next election? Are some of the issues tied to the loss of so many senior staff since this Council took office? Would the same situation have arisen if we had more seasoned senior staff in place and resultant less burden on the CAO? Why does Council claim to only have found out recently about this issue when The Auroran communicated the issue months ago. See copy of staff memo here courtesy of Cllr Buck. If the repair issues were a matter of safety, how much impact did Council’s demonstrated difficult making decisions have on staff actions. Were they damned if they did – damned if they didn’t? What is the confidence in Council by the community? What facts are correct and which ones are being manipulated to satisfy different agendas. Shouldn’t there only be one agenda — what is best for the Town? Why do Council keep talking about getting the money returned — implying that the town is out approx $442,000. The newspapers have reported that the bulk had already been paid by the insurance company and just a smaller amount was still outstanding. Are the papers wrong and if so, why did the letter from Council not clarify this issue. If the newspapers are right, why the implication by Council. How much money is really outstanding to be repaid to the Town? Why has the outstanding dollars for the repairs (which should be pursued by the Town) been tied to inappropriate behaviour by the staff? Staff actions don’t appear to have anything to do with this subject, but the message has implied that staff behaviour has lead to this lawsuit. The shouldn’t be any connection. It re-opens the CAO termination issue. Was this used a “justification” for firing the CAO? If so, why was there a reported termination package versus dismissal with cause. Is there really cause fore the dismissal, or was this just an excuse? When will the citizens know the facts? Many of these issues have been the subject of separate posts — some which are listed at the right side because they were already the Most Popular Posts based on number of comments. Openness and transparency is used by this Council regularly, it has become their mantra. It was used in both recent letters. However, how open and transparent are they being? Let’s continue to push for the full story – then we can make our own decision. What other questions need to be answered? What is Council doing to answer these questions? The letters are not enough, more information needs to be communicated. Share your thoughts. What are the important questions/issues to you and how do you think they should be handled. 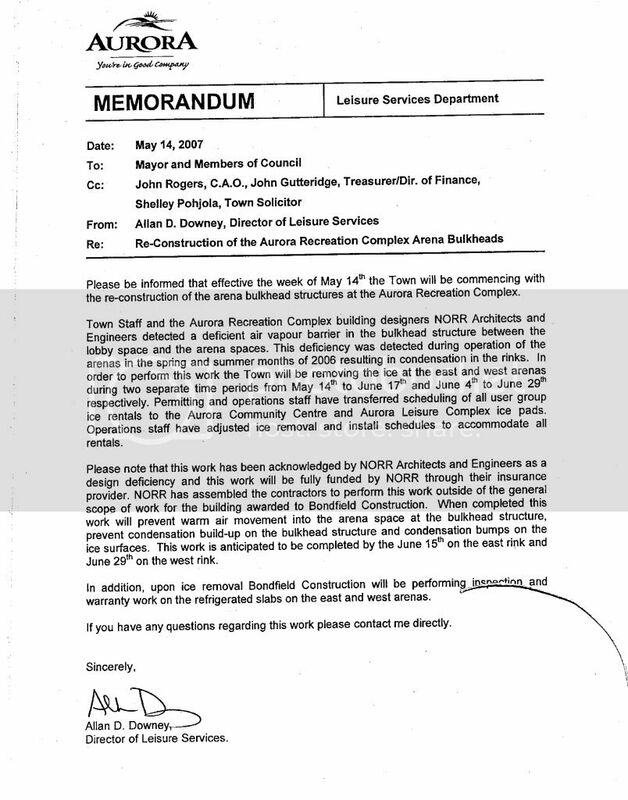 This entry was posted on November 23, 2008 at 4:07 pm	and is filed under Community Input, Town Council. You can follow any responses to this entry through the RSS 2.0 feed. You can leave a response, or trackback from your own site. I do not intend to deceive…. I have deceived that to eliminate some of the “anonymous” postings, I will from now on use this name in my postings. I have a number of postings here already as anonymous. For the benefit of those that wish to see our provincial government step in and investiage what is going on with our Mayor and her followers on council, I spent about 5 minutes doing some reserach for the contacts that are the ones that need to get involved. I encourage everyone to send emails or faxes and call the offices to suggest that there is at a perception of wrong-doing at Aurora Council and while we are only half-way through the term, it cannot be allowed to continue. Be respectful of the positions of the people that you contact and it will be rewarded.